NOUVEAU!!! La cabane de Lorna. Idéalement situé dans la ville fantôme de Terlingua. La cabane de Lorna dans la ville fantôme de Terlingua est la base idéale pour vos aventures dans le Big Bend. Cette cabine nouvellement construite est située au coeur de la célèbre ville fantôme de Terlingua. Vous serez à quelques pas de toute l'histoire, de l'art, des restaurants, de la boisson et des divertissements de la ville fantôme. Depuis la ville fantôme, vous êtes à quelques minutes du parc national de Big Bend, du Rio Grande, de Lajitas et du parc d'État de Big Bend Ranch. La maison est écologique avec l'énergie solaire et une petite taille. Construit en 2014 comme la maison de vacances personnelle des propriétaires, Lorna's Cabin est bien conçu, confortable, attrayant et pratique. Il dort deux personnes en bas et peut dormir deux autres dans le grenier. Le loft mesure moins de 3 pieds de haut. C'est idéal pour un couple ou un couple avec des enfants. La cuisine est petite mais entièrement équipée et stockée pour la préparation des repas. Le salon est de taille confortable et confortable avec un canapé en cuir et une chaise et des vues sur les montagnes de Chisos. La chambre a un nouveau lit queen-size et des draps de qualité. Le loft est recommandé pour les enfants en raison du plafond bas. Il a deux nouveaux lits jumeaux et donne sur le salon. À l'extérieur de la cabine sont deux porches couverts avec vue sur la montagne, un anneau de feu pour les feux de camp, et un petit grill de charbon de bois. Situé sur la seule route goudronnée de la ville fantôme de Terlingua, le Lorna's Cabin offre un accès facile à tout ce que Big Bend a à offrir. Passez vos jours et vos nuits à faire autant ou aussi peu que vous le souhaitez. Une fois que vous restez ici une fois, vous aurez envie d'y revenir encore et encore. Nous serons heureux de vous avoir. 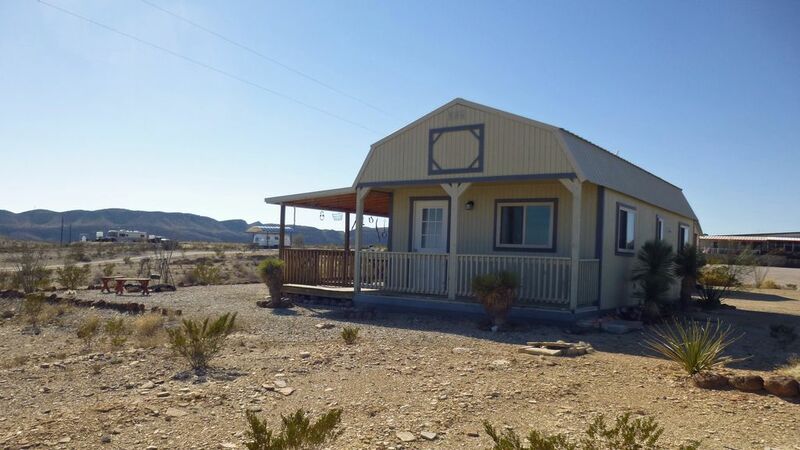 Lorna’s cabin is the ideal location to enjoy Terlingua & Big Bend National Park. We went across the Rio Grande by boat to Bocillas, drove into the park, drove to Lajitas, attended the 16th annual Chihuahua races, took a walking tour of Terlingua Ghost Town. It was always delightful to return to Lorna’s cabin each night for a shower & good night’s sleep on the comfortable bed. Communication with the owner was easy & directions to location were clear. They provided good recommendations for places to eat. Perfectly located in Terlingua. Close Big Bend NP. Close to the best places to eat in Terlingua. Kids loved the beds in the loft. Clean. Cold fridge. Functional heaters (for cold nights in March). Couldn't ask for more. We had a great time and will be back. We loved it for our family of four (kids are almost 13 and 10). The loft area was great for them, but may be an issue for adults. It's about 40 mins to each park which was a bit longer than expected so more driving after a 10hour trip just to get there from DFW area, but we were prepared for it. It was more densely populated than we expected, but it turned out to be a nice thing. We did not visit the restaurants and stayed away from anything with internet purposely (but the temptation was stronger due to how close we were to other people). We would likely stay there again if we didn't have closer access to the park if that was our objective of the vacation. Ghost town is pretty cool! We are delighted to hear that Courtney and her family enjoyed their stay. It is always our objective to provide our guests with a trouble free and enjoyable home base for their Big Bend adventures. Distance to Parks: This cabin in less than 15 minutes drive time to either the west entrance of Big Bend National Park or the Barton Warnock visitor center of Big Bend Ranch State Park. However, both parks are HUGE. Drive times once in either park will vary depending on where you are heading within the parks. Population Density: We assume this comment was related to our massive Spring Break crowds and not to the local population. These guests were here during our busiest time of the year. We welcome guests during our busiest times (Spring Break, Thanksgiving, Christmas/NY, and Chili Cook-Off), but recommend that they visit when things are not so crowded. Comfy. Needs a larger water heater. Trouble starting wall heaters, called and management came in a few minutes. Convenient to everything in ghost town. Close enough to the park. Lorna’s cabin is situated in Terlingua ghost town It had everything we needed for two couples for our 3 night stay. It was clean and comfortable. The loft space had 2 beds which was fine and it was ok for sleeping as the headroom is very low. The double bed was a large enough room. Thoroughly enjoyed our stay here, Terlingua Ghost town is a great place to stay. The views from the cabin were amazing. Ate in the Starlight Theatre, food and live music were good. Spent our days in the Big Bend National Park. The park is awesome, fantastic hikes and views. Would love to come back to this area. Travelled from the UK.